At first when we left the apartment in Paris, I could't stop blushing. This vintage dress is really see through and I chose not to wear an under dress. But a few moments later I was like "what the hell, it's fashion week!" And I had so much fun in the dress! 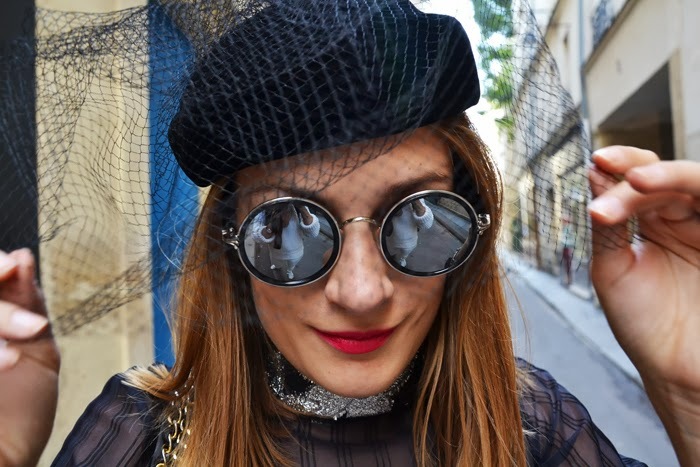 I got snapped a few times by street style photographers. Here is my photo on Teen Vogue (!). I absolutely can't wait to go back to Paris, it's just so amazing over there! I found the shoes at Spartoo. My old low booties have had their best days so it was time for new ones! Photos by Stephanie and Sophie. Super leuk! Echt totaal anders..
Blijft een topoutfit! Terecht dat ge op Teen Vogue staat! Ik zal die close up met u bril es doorsturen, is echt ne mooie foto! Oh wauw, wat een super outfit!